Striker Sammy Morrow has signed for Institute. Striker Sammy Morrow is hungry to play his part in Institute’s Championship title charge in 2017 after signing a deal until the end of the season. 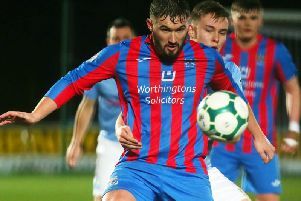 The ex-Coleraine man, who was released by the Bannsiders earlier this week, can’t play for Stute until January, but will be a spectator at Saturday’s Championship game against Ballyclare Comrades at Drumahoe. “I’m really looking forward to the challenge at Institute,” he said. The 31-year-old played with Kevin Deery at Derry City and the Stute boss’ winning mentality is exactly why he decided to return to the Riverside Stadium. “I have known Kevin a long, long time. We were kids together at Derry and he’s a very passionate man about football,” he added. “We played together for three or four seasons at Derry and I know exactly what he’s all about, he’s a winner, first and foremost and that’s what am I as well.